Heads or Tails, also known as coin flipping, is a way of making a decision by flipping a coin in the air and guessing which side will show when it lands. In Australia, two-up is a gambling game once popular with both young and old that increased the challenge by employing two coins, traditionally pre-decimal currency pennies. Placed on a board, or ‘kip’, the coins would be thrown into the air by a designated ‘spinner’. Chinese officialdom has a dim view of games of chance and it decries those who want to have ‘a bob each way’ (‘bob’ is British slang for a shilling coin), that is people who hedge their bets. Nonetheless, in every policy area Xi Jinping’s party-state is itself a gamble, its hopes pinned on the continued success of its authoritarian capitalism. At the core of its enterprise and its credo lies repression, censorship and state-sanctioned violence. Xu Zhangrun, the outspoken professor from Tsinghua University who published a Jeremiad criticising Xi’s China in July 2018 (Imminent Fears, Immediate Hopes, China Heritage, 1 August 2018), is the latest victim of the malevolent workings of The China Story. Chairman Mao instructed us that: ‘Reactionaries are ill-at-ease when the Masses are happy’. 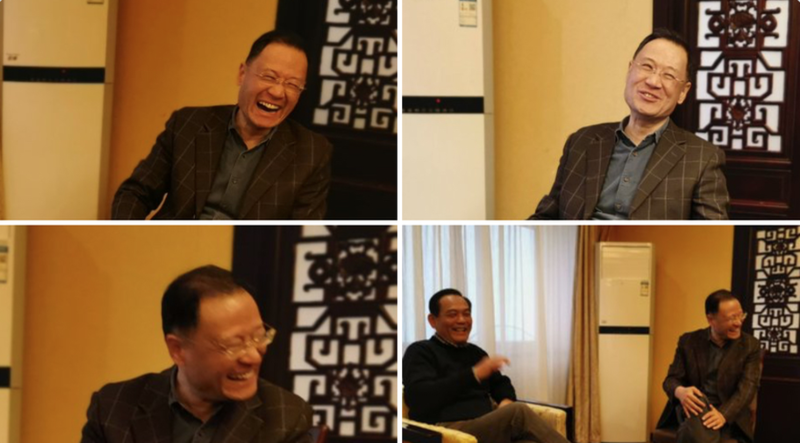 It was impressive to see Mr Xu Zhangrun laughing and in such good spirits, refusing to give in to despair, showing no signs of fear. When the learned are shameless, the land itself knows no shame. This is a national disgrace: Tsinghua professors, how can you possibly live up to your intellectual ancestors and face those who will come after you? The Chinese authorities are anxious to avoid inciting unrest during 2019, a year replete with anniversaries of numerous painful events — the legacy of the 1919 May Fourth Movement, the violent suppression of the 1959 Tibetan Uprising, the 1989 Protest Movement and Beijing Massacre, as well as the 1999 outlawing of the Falungong sect, among others. By suspending Xu Zhangrun and setting up a task force to persecute China’s most outspoken public intellectual at a sensitive moment, Tsinghua University reminds us all of its shameful history of intellectual repression, academic dishonesty and violent politics. In a state of denial, in a nation of shamelessness, Tsinghua is a particularly tainted institution. Zha Jianguo (查建国, 1953-) is steely oppositionist. A resident of Beijing, Zha has for many years been a voluble critic of the Chinese government. For more on his cantankerous and resilient stance, see Jianying Zha’s ‘Enemy of the State: The complicated life of an idealist.’, The New Yorker, 23 April 2007 (Jianying is Jianguo’s younger sister). 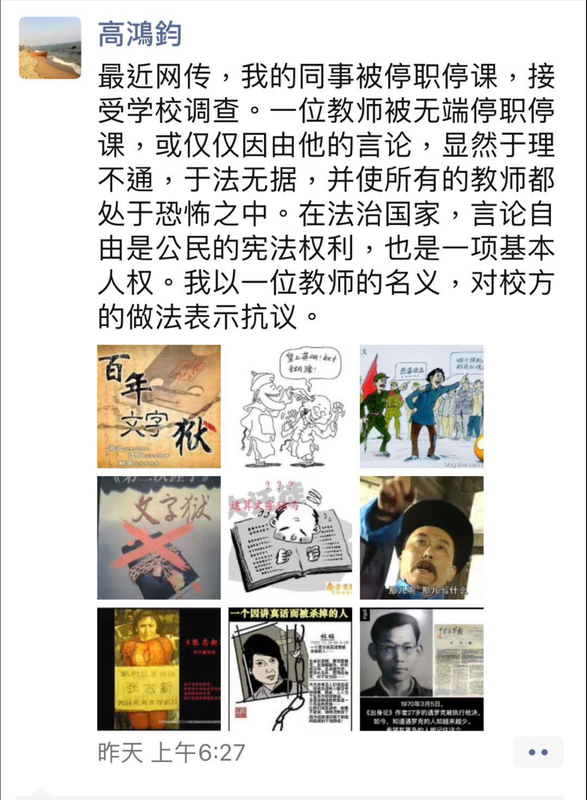 Below Zha Jianguo reacts to an opinion piece attacking Xu Zhangrun that was published on 27 March under the name ‘Shan Renping’ 單仁平 (possibly a homonym for 善人評: ‘a decent man’s critique’), the nom de guerre of Hu Xijin 胡錫進, editor of The Global Times, an apologist newspaper that we have previously described as contemporary China’s version of Der Stürmer. Zha’s essay was deleted by China’s internet invigilators almost immediately, perhaps to spare the sensitivities of Shan/ Hu. This material is archived both in The Best China and the Xu Zhangrun 許章潤 sections of China Heritage, under Projects. Tang Yun was an associate professor at Chongqing Normal University cashiered by his institution on 20 March 2019 on the grounds that, during a lecture on the writer Lu Xun, as reported by students, he had made statements that were to be ‘detrimental to the nation’s reputation as well as being in flagrant violation of acceptable political standards’. Xu Zhangrun made a point of quoting Tang’s poem when he was suspended by Tsinghua University. Over recent months, some of the writings of Professor Xu Zhangrun of Tsinghua University have been the focus both of international media attention and online discussions in China. In response to this Shan Renping 單仁平 [aka, editor Hu Xijin 胡錫進], a regular opinionator of The Global Times, published an article titled ‘To Be Constructive, Critics Must Adhere to Three Principles’ 搞批評應守住三個原則, 實現建設性 [or ‘Three Illiberal Principles’ for short]. Below, I challenge Mr Shan’s views and advocate ‘Three Liberal Principles for Criticism’ 批評應有的三個自由原則. We must resolutely oppose any kind of criticism that questions the authority of the ruling party or that in any way undermines people’s confidence in the content or direction of national policy. This is tantamount to declaring that the authority of the rulers and confidence in them is entirely dependent on the censoring and banning of all independent criticism. Past or present, be it in China or elsewhere, such behaviour has been and is that of Autocrats. In China it is not permissible for critical works to contravene the Constitution or to direct negative comment at the basic political system of the People’s Republic. Again, according to his ‘Three Illiberal Principles’, Shan Renping says a critic must ‘not only be observant of realities as they exist on-the-ground, but they must also be mindful of the overriding realities of the situation as a whole.’ So, pray tell, just who is to be the judge of what exactly constitutes ‘reality’ or ‘facts’? It certainly cannot be China’s Rulers or official media outlets such as The Global Times. If there is an ongoing dispute about the facts concerning a particular incident, then there are independent judicial authorities who can investigate and determine the truth. As for the truth or facts regarding the bigger picture, well, that is a matter for History. Again, Mr Shan tells us that ‘it is incumbent upon critics to avoid giving people the mistaken impression that some localised issue is representative of the state of affairs in the nation as a whole.’ I would aver that the relationship between one’s local situation and observations of it and the overall situation is a matter for independent judgement. It is not something that can or should be determined unilaterally by The Powers That Be. On the basis of these ‘Three Liberal Principles’, I would suggest that criticism can play a constructive role in the development of the nation. Mr Shan’s ‘Three Illiberal Principles’, by contrast, reflect the non-constructive stance of conservative forces that can only hinder the nation’s evolution. The freedom to criticise is inherent in the basic human rights of a person who enjoys free speech and it is a focus of the contestation that is unfolding among the various political forces in China today.